A recent paper (free) in Geophysical Research Letters reports the discovery of long anticipated ionospheric disturbances caused by the passing of the moon’s shadow over the earth during an eclipse. The paper, submitted by the MIT’s Haystack Observatory, reports the occurrence of ionospheric bow waves associated with the shadow ground-track of the August, 2017, North American eclipse. The online source, MIT News, summarized the discovery. 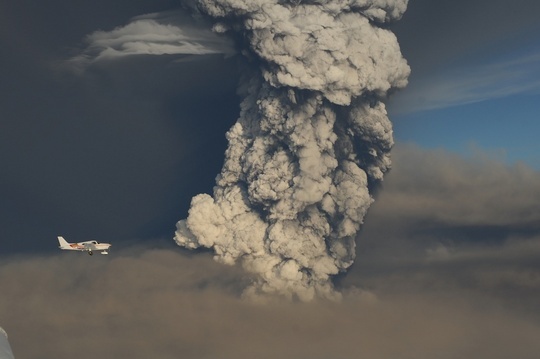 The Grimsvötn eruption in Iceland began its eruption on May 21, 2011 with the injection of considerable ash into the navigable airspace to the east. Excellent photographs can be found at the Icelandic Met Office. Grimsvötn is a very prolific basaltic volcano located on the southeast part of Iceland. Grimsvötn is the most frequently erupting volcano in Iceland, with the most recent eruption in 2004. According to one source in Iceland, the eruptions have presently subsided to steam venting, though no one is prepared to say that the eruption is over. The safe distance for viewing is said to be 2 km. Okay, the monkey thing didn’t happen. One thing I’ll get out of this is to be more reticent to volunteer for projects that seem simple in concept. Nothing is simple. Every single thing has degrees of freedom you can’t see and local minima to sink into on the way to the prize. It’s a dangerous world out there and in ways you can’t imagine. This is the week for wildlife encounters. While cycling yesterday we watched a hawk swoop down and grab its prey. Moments later the hawk flew away with a smallish (ca 12-14 “) snake in its talons and making its shrill cry. It landed on a nearby rooftop where it enjoyed its catch. I’m sure this kind of thing warms the heart of any homeowner lucky enough to host the feast. This morning we climbed to a cave along a cliff face (on private land) to see a vulture nesting site. The cave was in the Fountain sandstone formation and was situated a good 4-500 ft above the roadway. The mother vulture was not present, but the two fledglings were in the cave. I say fledgeling, but I doubt that these young ones have flown yet. According to the land owner who has been carefully and quietly observing their progress, the youngsters have not yet flown. Not seeing the young birds from a distance, we slowly climbed toward the cave entrance long enough to grab some snapshots. The cave is actually a covered crevice that derives from a dislocated sandstone slab which quickly narrows to a very small cross section. With the camera flash, a photo of the young birds was captured in the dark recesses. This is rattlesnake country so we were not eager to venture too deep or linger in this crevice. The property owner mentioned finding a ball of rattlers under a rock partway down the hill. We had no interest in uncovering our own ball of rattlesnakes. The young birds still had some of their down. This top photo was taken from ca 3 meters distance. Shortly after this photo the bird scrambled into the deeper recesses and out of sight. They make a curious hissing noise which is surely a sign of distress. The buzzard cave was found in the red sandstone of the Fountain formation, west of Loveland, Colorado. The Fountain Formation is the deepest of the sedimentary formations along the Colorado Front Range. It is seen only along the western margin of the Great Plains here owing to the uplifting effect of mountain building. In fact, this sandstone formation consists of the eroded debris of a previous iteration of the Colorado Rocky Mountains. The present iteration is often referred to as the Laramide Orogeny. The photo above shows both the sandstone of the Fountain Formation in the foreground and in the upper left, in the background, the uplifted plutonic rock formation consisting of gneiss and schist. For those of use who carry around an interest in nuclear science, there is a short but interesting article in the Daily Kos written by a chemist on the topic of the Hanford site in Washington. Of particular interest is the link describing a radiological assay of a chemist who died at age 76 of cardiovascular disease. At the time of death they found 540 kBq of activity in his body- 90 % in his skeleton. The gentleman had been involved in a glovebox explosion involving exposure to 241-Am at age 64. What do you do with a radioactive corpse? One option is to donate your body to science. The WSU College of Pharmacy maintains a registry of data culled from uranium and plutonium workers. A recent description of donated bodies is found in this pdf. One donation is from a plutonium worker who was present in the 1965 fire at Rocky Flats. He retained an estimated 6.8 kBq of lung burden. They did not specify how this was determined. Rocky Flats did have state of the art whole-body monitoring and a substantial health physics department. Pu detection is a little tricky because one of the important markers for Pu contamination is 241-Am, an alpha and gamma emitter (Pu is a bad actor mostly because of internal alpha exposure). Residual and highly active 241-Pu (104 Ci/g) beta decays to the highly active 241-Am. Unfortunately, not all Pu isotopes decay into Americium. This Am isotope allows for gamma ray spectra to be gathered so an estimate of Pu exposure can be calculated. The ever popular 239-Pu isotope alpha decays to 235-U without much gamma emission. So, the calculation of Pu exposure and dose depends on knowing the purity of the Pu at issue. If your sky is dark enough, it’s worth stepping outside in the next couple weeks to look for Comet Holmes in the constellation Perseus. The comet is somewhat west of Mirfak, the alpha star in Perseus. Download some kind of reasonable star chart or better yet, dig up some of that money you have buried in the back yard and spring for a copy of Sky and Telescope at the super market- It’s not gonna kill ya. As for Th’ Gaussling, I’m fond of the Norton Star Atlas. According to the charts, if you make a line between Mirfak and the lambda star, the comet is nearly in the middle of that line as of this date. It’s hard to miss. It is a fuzzy circular blob lacking a visible tail. It has a striking surface brightness that sets it apart. Binoculars are a must for the full effect, though is a naked eye object. For you green horns who are new to constellation work, before you go outside, actually look at your charts. Find Perseus (between the Pleiades and Cassiopeia) and then find some easy reference stars to make your own pointer stars that will form a line that extends to the approximate location of the object of interest. If you can get two lines that cross at the region of interest, so much the better. I used the gamma and delta stars in the “W” of Cassiopeia as pointer stars to find Mirfak. For late linkers to this post, you’re probably out of luck. Check the date. Check out this video of Daniel Dennett talking about dangerous memes. Dennett is a philosopher specializing in the study of conciousness. In another TED conference, he offers insights on this difficult topic. Our consciousness is not a universal chip set capable of processing all inputs with equal fidelity. In fact, our consciousness has rather serious limitations. The TED conference videos are extremely rich in insights. It is worth browsing the site for good talks. The mechanism of consciousness is fascinating- it is one of the most important of all unresolved problems. The existence of consciousness means that the universe is self-aware to some extent and is able to do experiments on itself. It also means that the universe is capable of acts that are set into motion by the compulsions of creatures, rather than the direct search for ground state. These acts are executed through the agency of physics, but sentient beings have altered the notion of spontaneity. Life forms are able to counter the natural direction of entropy (locally) by channeling large amounts of energy to achieve improbable ensembles of atoms. With large energy inputs, creatures can move about, reproduce, or send robots to Saturn. Ok, this is obvious, but it remains a rather curious attribute of the universe. One has to wonder what the original inhabitants of North America thought of the tornado (how do you say “WTF” in Lakota?). I have visited a few museums in my travels but have never seen any artifacts or heard of any references to Native American perceptions of the tornado phenomenon. Without a doubt, Native Americans were visited by tornadoes. The experience must have certainly left an impression. It would be interesting to hear any stories that may be out there. An internet search just offers a Mulligan stew of hits with tired references to Pecos Bill or to the odd disaster in Kansas. North America is climatically privileged in that there is the possibility that overland southerly flows of cold dry air from the north can readily contact flows of warm moist air from the Pacific, Gulf of Mexico, or the Atlantic. Vertical mixing of unstable humid air results in convection cells that are further driven by the latent heat of condensation. These humid flows are spun up by the coriolis effect and wind shear to afford monster anvil storm cells that can tower to 50,000 ft or higher. Here in Colorado we often see lines of isolated storm cells in the early evenings of summer, red in color at low altitude changing to yellow-white at altitude near sunset. Very often you can see mammatocumulous features signifying violent mixing activity. It’s no place for an airplane. It is interesting to speculate as to how our modern mythologies and iconographies might have been different if the tornado phenomenon had been common in the Mediterranean and the middle east. Would Charleton Heston have summoned a tornado to smite Yule Brynner’s Egyptians rather than parting the Red Sea and drowning the buggers? Perhaps the Pharaohs might have built great stone helices rather than oblisks. Aristotle might have written a treatise on the handedness of helical flows or whether the air flowed radially into or out of a tornado. If the tornado had been a common phenomenon in the middle east during the iron age would the “Big Three” Abrahamic religions today feature tornadic iconographies in their texts and monuments? If so, perhaps the great cathedrals of Europe might today have relief sculptures or stained glass windows portraying the Israelites or Philistines being driven hither and thither by the swirling wrath of the Almighty’s cyclone. One of my most prized books is a tattered copy of Grignard Reactions of Nonmetallic Substances, by M.S. Kharasch and Otto Reinmuth, published in 1954 by Prentice-Hall. It is a 1384 page tome containing a vast number of examples of Grignard reagent chemistry and reaction chemistry with extensive references through 1954. Morris Selig Kharasch was a professor at the University of Chicago and is primarily known for his work with free radical chemistry. To Kharasch is credited much of the early work in sorting out the mechanism of anti-Markovnikov addition of HBr to olefins. Reinmuth was the second Editor of the Journal of Chemical Education (1933-40). Two coworkers, Frank Mayo and Cheves Walling, went on to make contributions toward the development of vinyl polymerization. Later in his career Kharasch turned to the examination of the Grignard reagent and many of its reactions. Among the list of his students and post-docs are H.C. Brown and George Buchi. Kharasch was instrumental in the founding of the Journal of Organic Chemistry and served on the Editorial Board for many years. It is interesting to note that Kharasch is credited with the patenting of Thimerosal in 1927, a product also known under the trade name Merthiolate which has been used as an antimicrobial additive in vaccines. There is an interesting post at the Daily Kos by Mentarch detailing the “Eight Principles of Incompetence“. Now, I’m not sure that this list constitutes a manifesto, guiding light, or even a footnote in a Polysci text of the future. But the author has cogently reduced to writing some observations that I have struggling to put into words. I tip my hat. Much has been said about the growing problem with Cheney. There is precious little to say about this fascist that is new. Cheney is doing a fine job of self destructing without my input. Mentarch has highlighted many of Cheney’s questionable actions over time with links to www references. It is hard to escape the conclusion that the electorate is collectively incompetent sometimes. But I would like to observe that the USA might have been well served by a parliamentary form of government, especially in this present troubled stretch of history. I think there are merits to a system that can vote out troublesome and destructive executives like Bush-Cheney without having to wait for the election timer to run out. Impeachment is not the same as a vote to form a new government. And if ever the USA needed to have a different executives in government, it is now. In fact, one has to answer the question of why parliamentary systems proliferated during the 20th century while the American model as set forth by the US Constitution remains largely limited to the USA. Why hasn’t our system been more closely copied? Could there be a better way? The US needs a president that is less showhorse and more workhorse. We need administrators who can manage the executive branch more effectively. And we need executives who are not beholden to absolute doctrines and are willing to re-examine their fundamental assumptions on occasion. The Bush-Cheney epoch has had a retrograde effect on American civil liberties, privacy, the freedom of assembly, and America’s credibility as a leading force for the advance of civilization. This damage will take many people a long time to make right. Obviously we will not change the structure of government in the next 25 years. We will not be able to yank bad executives out of office midterm for incompetence. Bad executives will hold on to their office for the duration, enacting laws that benefit subscribers of their particular creed. They’ll have to commit a felony and be shamed into resignation like Nixon. The USA needs better checks and balances to protect the republic and its diverse constituency from Trojan Horse carriers of fringe doctrines and monotonic ideologies. I’d rather have a president who cracks the books once in a while rather than one whose sole intellectual reflex is to whisper to iron-age deities. I’d prefer to have a president who thinks analytically rather than devotionally.